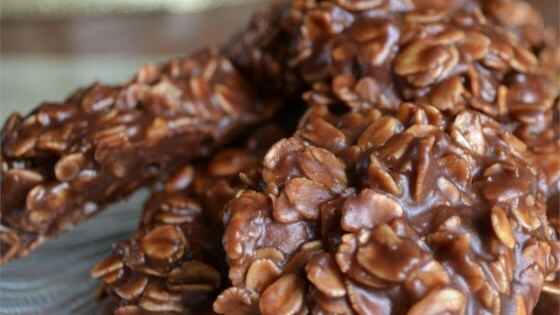 "Oatmeal, peanut butter, and chocolate no bake cookies." Heat cocoa, sugar, milk and butter over medium heat. Boil these verrrrry slowly (they will turn out better) when they reach the boiling point boil them for no longer than 90-120 seconds. Stir together oats, peanut butter and vanilla with a big wooden spoon or Kitchen Aid. Pour the hot mix over the oatmeal mix and drop on wax paper. See how to make a simple chocolate, peanut butter, and oatmeal cookie. Just like I remembered them! Easier than I remembered also. Thanks!!! A hint: before you spoon onto wax paper, let mixture cool for just a moment so it's easier to control size of cookie. be sure to bring to a rolling boil.